Aaah, there ain't a goddam place you can get a million-dollar wound that it don't hurt. This was hailed by Time as the best novel about the Second World War. And for once, Time might have it right. If we add the qualifier "American" between "best" and "novel". I was surprised in reading it recently to find how well it holds up. In fact, I like it more now than I had when I'd first read it many years earlier. The first reading may have unfairly compared The Naked and the Dead to war stories by Hemingway, Remarque and others after the First World War. The title even sounds Hemingwayesque. But the prose is less sculpted than Hemingway's, scenes could be edited out (it's a very long book), and the tone is very different. The "lost generation" of the 1920s was cynical about its war experiences but, particularly in the writing of Hemingway, the authors held to a personal code of honour. Mailer's soldiers however learn that no code is worth anything in the face of war. They end up hopeless individuals, trusting nothing. The story takes place on a Pacific island during battles between the Americans and the Japanese. Death comes indiscriminately to both gentle and vicious characters. And it comes in split seconds. Under the horrific pressure of battle the soldiers reminisce about their past lives and interact with each other brutally. They become woman-haters and Jew-baiters. There is little to affirm, nothing to uplift. It's all ugly and dirty—and compelling fiction. 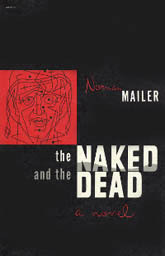 Written when Mailer was only 25, The Naked and the Dead remains his masterpiece. This is before he adopted his later strategy of throwing every odd thought about a thing on the page in hopes that something would sound profound or at least that the sheer volume would overwhelm the reader. Yes, this novel could use some more editing. But, as it stands, it is one of Mailer's most disciplined, realistic and psychologically credible works. By the way, don't blame Mailer for unrealistic dialogue when his characters complain about fuggin' this or fuggin' that. He was forced by the mores of the times to use that made-up term in place of the more expressive F-word that shows up in his later work.